To me, it wouldn’t be the holiday season without peppermint bark. There’s no other confection that makes me feel instantly festive in every way. 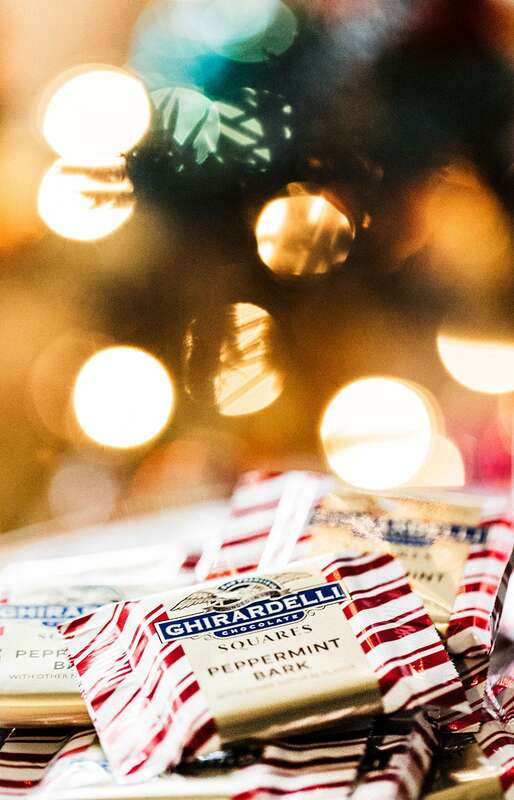 The moment I see the iconic red-and-white stripes of a Ghirardelli Peppermint Bark SQUARE is the moment I really start celebrating the season. It’s something I look forward to all year! I just can’t get enough of those SQUARES! That creamy yet crunchy bite is oh so satisfying. Not to mention the refreshing peppermint flavor paired with sweet chocolate. There’s no better way to indulge during the most wonderful time of year. Whether you find them stashed away in my home office, or loaded up in our Christmas stockings, we take full advantage of the limited peppermint bark season. Recently, however, my favorite way to enjoy these heavenly SQUARES has been to melt them into hot cocoa. That’s right, you can take Peppermint Bark SQUARES and melt them into any hot cocoa. It instantly intensifies your cocoa, giving it a burst of peppermint flavor. What could be better? Cozying up to the Christmas tree with a mug of something warm and sweet is the ultimate way to enjoy the season. 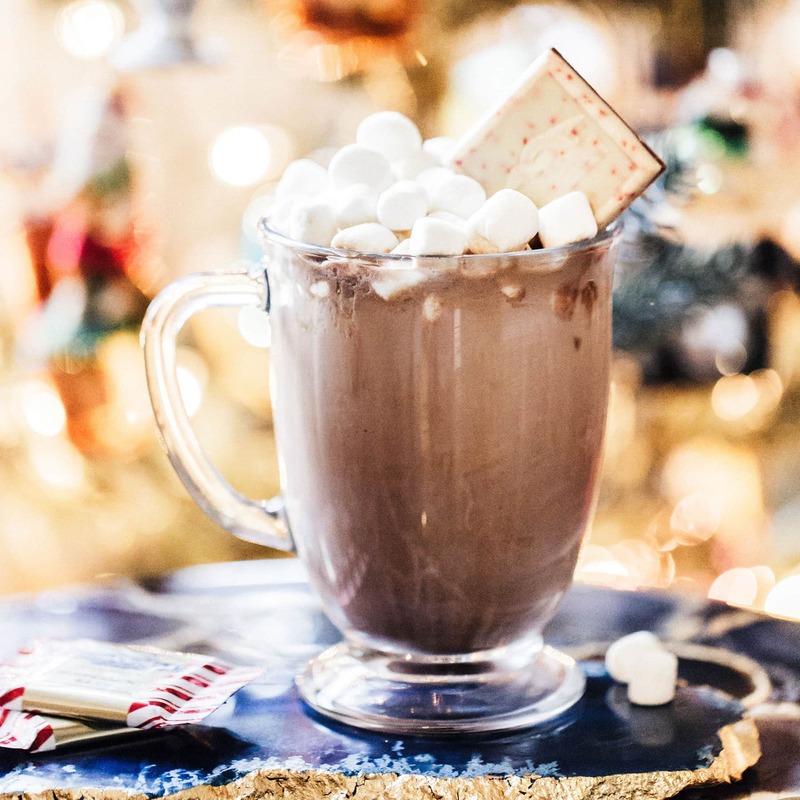 The recipe for the Peppermint Hot Cocoa is down below, but I also have a cute printable recipe card for it you can find here. 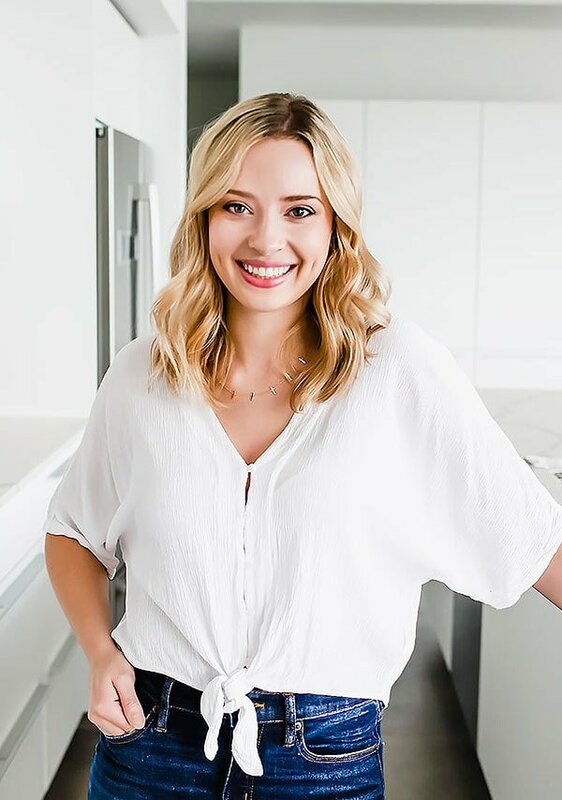 Maybe you can add it to your holiday recipe book! 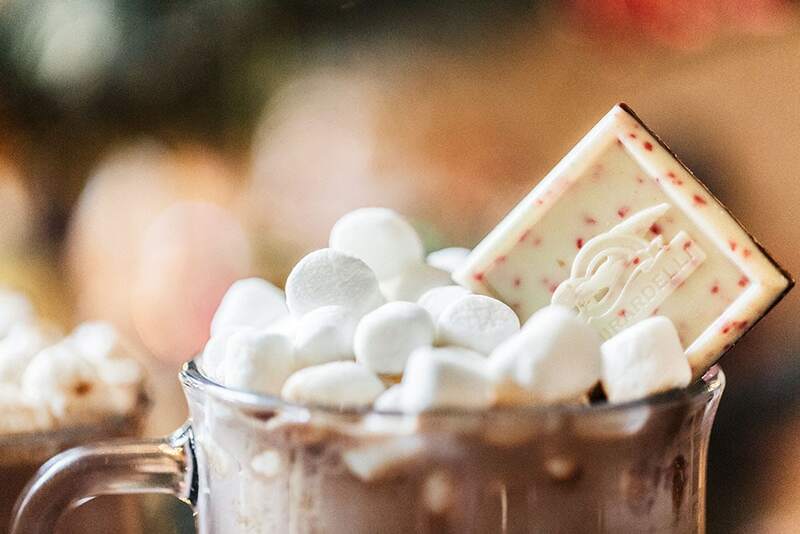 If you’re interested in creating adorable Peppermint Hot Cocoa mixes as DIY edible gifts, then here are the basic instructions. They’re perfect for gifting to your neighbors, coworkers, or schoolteachers! Combine the sugar and salt. 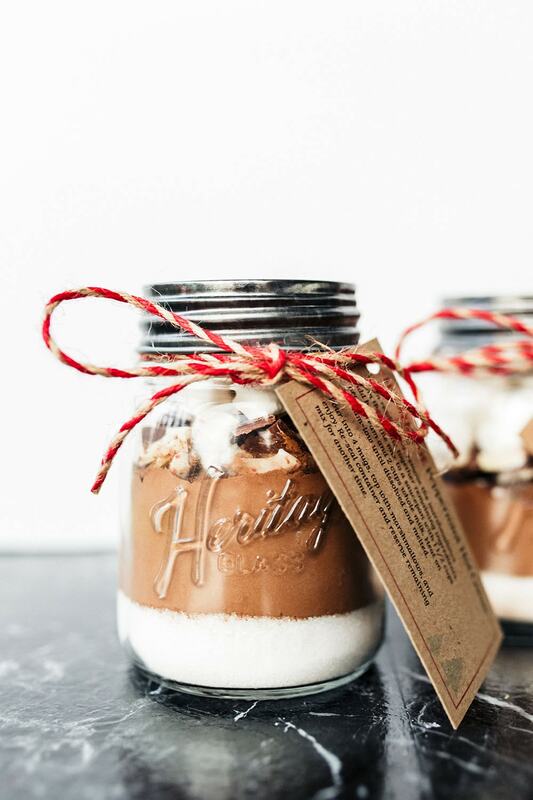 Layer the sugar mixture, cocoa powder, Peppermint Bark SQUARES, and marshmallows in two mason jars. Seal. Tie a decorative ribbon around the container and attach this printable instructions tag, or make your own. It’s so easy but so pretty! If you make the DIY gift jars or this Peppermint Hot Cocoa Recipe, be sure to take a picture and tag myself @handletheheat and @ghirardelli on Instagram so we can see and share! In a saucepan, combine the cream, milk, sugar, cocoa, and salt. Heat over medium-low heat. When the cream mixture just begins to steam, add the chopped chocolate, and stir, until melted. Divide the hot chocolate among 4 mugs and top with marshmallows. This is perfect timing! 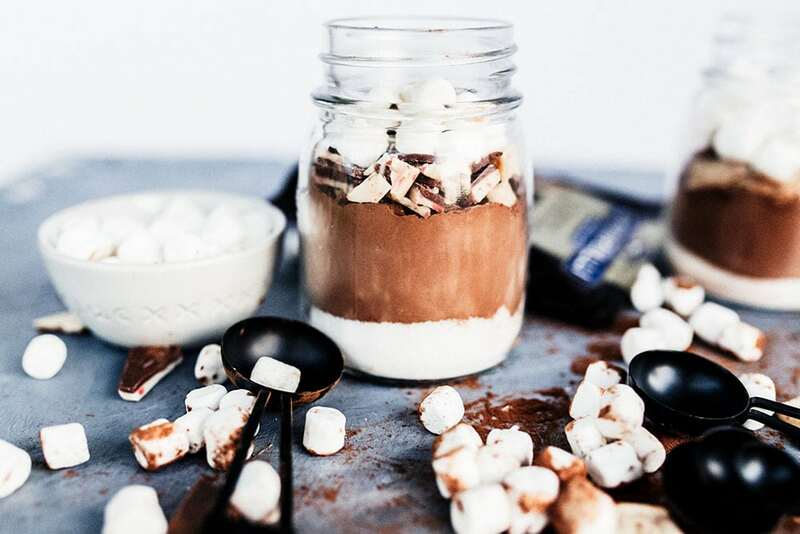 My daughter wants to make hot cocoa jars for gifts, and this looks like such a delicious mix. What size mason jars did you use? Hi, Love this recipe but the directions dont state when to add the Ghirardelli unsweetened cocoa powder? when do you add the cocoa powder? The sugar mixture goes in the jars first, followed by the cocoa powder…. 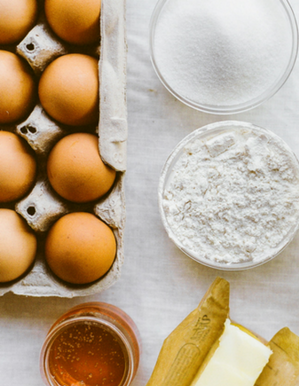 Your recipes have become some of our family favorites. This doesn’t disappoint. We discovered Ghirardelli makes these into “chips”. 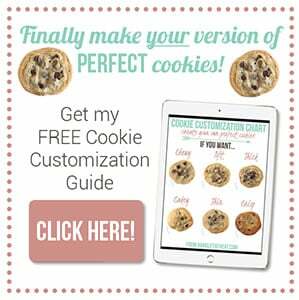 Add them to your favorite chocolate cookie dough recipe and you have a quick holiday cookie. YUM! I just love that!